GREEN BANK, WV -- New studies with the National Science Foundation's Robert C. Byrd Green Bank Telescope (GBT) have revealed a previously unknown population of discrete hydrogen clouds in the gaseous halo that surrounds the Milky Way Galaxy. These clouds were discovered in the transition zone between the Milky Way and intergalactic space, and provide tantalizing evidence that supernova-powered "galactic fountains" continually blast superheated hydrogen gas into our Galactic suburbs. clouds of Hydrogen gas above the plane of the Galaxy. Credit: Kirk Woellert/National Science Foundation. Extending far above the star-filled disk of the Milky Way is an atmosphere, or halo, of hydrogen gas. "By studying this halo, we can learn a great deal about the processes that are going on inside our Galaxy as well as beyond its borders," said Jay Lockman, an astronomer with the National Radio Astronomy Observatory (NRAO) in Green Bank, West Virginia. "It has remained a mystery, however, how this halo formed and what has prevented gravitational forces from collapsing the gas into a thin layer long ago." 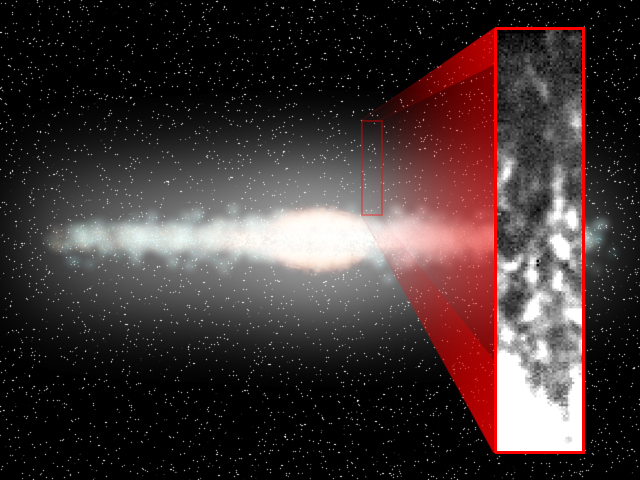 Some astronomers have speculated that this gas is distributed as a diffuse mist held up by either magnetic fields or cosmic rays streaming out of the plane of the Milky Way. Others believed that it is made of innumerable long-lived hydrogen clouds bobbing up and down like balls tossed by a juggler. Early observations with other telescopes discovered that there was some neutral hydrogen gas floating far above the Galaxy's plane, but these instruments were not sensitive enough to reveal any structure or resolve questions about its origin. Lockman's studies for the first time show a clear picture of the structure of the gas. Rather than a mist, the halo is in fact full of discrete clouds, each containing 50-to-100 solar masses of hydrogen and averaging about 100 light-years in diameter. "These objects were just below the ability of the older telescopes to detect," said Lockman, "but I looked with the GBT, and they popped right out." Lockman's results will be published in the Astrophysical Journal Letters. The clouds were discovered about 15,000 light-years from Earth toward the center of our Galaxy, and about 5,000 light-years above the Galaxy's plane. One of the most compelling facts revealed by the GBT is that the clouds are coupled dynamically to the disk of the Galaxy; that is, they follow along with the rotation of the rest of the Milky Way. Material from other sources crashing into the Milky Way would have different velocities and also appear quite different. "These are home grown objects, and not interlopers from outside our own Galaxy," said Lockman. Although the origin of these newly discovered clouds is not yet known, one mechanism to explain how this gas could be lifted into the halo is through supernova explosions. When a massive star reaches the end of its life it erupts in a cataclysm that produces a burst of cosmic rays and an enormous expanding bubble of gas at a temperature of several million degrees Celsius. Over time, this hot gas can flow outward into the Milky Way's halo. The question remains, however, what happens to this gas once it's ejected into the halo. One possibility is that it leaves the Galaxy as a wind, never to return. Some astronomers predict, however, that as the gas slowly cools it would condense into hydrogen clouds, eventually falling like raindrops back into the Milky Way, and forming what is referred to as a galactic fountain. "If the clouds were formed by material ejected from the Galactic plane into the halo," Lockman said, "then it's possible that they are now falling back onto the Galaxy. This would then require a continuing flow of new material from supernova explosions into the halo to replenish the hydrogen gas that has rained back into the disk." The researcher comments that further observations, now in progress, should clarify the properties of these halo clouds, determine their distribution throughout the Galaxy, show how they are related to other types of clouds, and reveal their internal structure. Radio telescopes are able to detect the naturally occurring radio emission from neutral atomic hydrogen. As hydrogen atoms move about in space, they can absorb small amounts of energy, sending the atom's single electron to a higher energy state. When the electron eventually moves back to its lower energy -- or resting state, it gives up a small amount of electromagnetic radiation at radio frequencies. The individual energy of a single atom is very weak, but the accumulated signal from vast clouds of hydrogen is strong enough to be detected by sensitive radio telescopes on Earth. The GBT, dedicated in August of 2000, is the world's largest fully steerable radio telescope. Its 100 by 110 meter dish is composed of 2004 individually hinged panels. It also has a unique offset feed arm, which greatly enhances the performance of the telescope, making it ideal for observations of faint astronomical objects. The GBT is completing its commissioning and early science program and will be moving into full time operation.